We’ve been sweeping up new releases in 2014 in batches and with the first half of the year now out of the way, we have four diverse, quality offerings from Black Bananas, Liars, Feed The Rhino, and Down. Jennifer Herrema’s career post-Royal Trux seems to have crystallised around this band (formerly known as RTX) and an impressively confident evolution of her sound. The band’s 2012 release 'Rad Times Xpress IV' – the first under the Black Bananas moniker - was a nod to her past and a look forward the future with its fusion of garage and dance, aimed squarely at the underground scene. 'Electric Brick Wall' is a step on and maps out a more robust musical personality based on noise ('Hey Rockin'), distorted guitars ('Dope On An Island'), unashamed rock idiom ('Ride The Chump') and heck even ex-partner Neil Hagerty as a guest ('Eve’s Child'). The album may be a nod to a fucked up on drugs past but it sets out a mighty set of tunes that are bang up to date and would slot right in to a crossover club night or a Japanese influenced lounge scene. A seriously good record. We reviewed 2012’s 'WIXIW' and found it somewhat provocatively obscure. 'Mess', in a similar way to the new Black Bananas’ record, is a much more straightforward statement of intent. We think it’s all the better for that and it bangs and bites in a way that its predecessor didn’t quite do. That’s not to say it doesn’t have its reflective moments like 'Can’t Hear Well' and 'Boyzone', but this experimental approach delivers a meatier, funkier side too as on 'Dress Walker' and 'Perpetual Village'. Liars can surely roar – opening up on 'Mask Maker' and 'Vox Tuned D.E.D.' – although closer 'Left Speaker Blown' winds things down with a less radio friendly 7-minute atonal meditation. 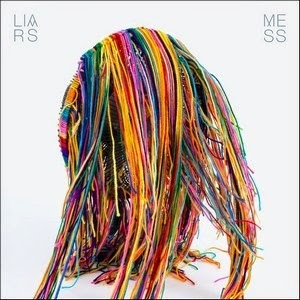 They probably tire of comparisons to LCD Soundsystem but that’s a mighty peak to aspire to, and Liars should go for it. We’ve also reviewed Feed The Rhino here previously and you can’t beat these Chatham lads for energy and a raucous enthusiasm, especially live. This, their third album, is perhaps a coming of age (a theme of this particular column) with a more considered approach to songwriting as compared with sophomore effort 'The Burning Sons'. Where that album had almost too many ideas to fit in, this one shows less is more, with a stripped down sound, rousing choruses and razor-sharp production. Of course that’s not without risk – and some growing pains are only natural. Stealthier tracks like 'Black Horse' and title track 'The Sorrow And The Sound' make a play for the major league and maybe come up a bit short. On the other hand when it all comes together as on 'Give Up' and 'Deny And Offend', you can imagine Feed The Rhino to be a band on the brink of bigger things. We suspect that once these songs have bedded in live they will tighten up and Feed The Rhino will be ready to really take on the big boys with album number four. Sludgecore veterans 'Down' seemed as though their best days may be behind them, although not many bands can claim to have made anything nearly as good as their first two albums 'Nola' and 'Down II' – a bustle in your hedgerow. Nonetheless that was practically in the last century and precious little of note has been produced since, except ill-feeling amongst bandmates mostly in and out of rehab. The plan for 'Down IV' – a series of EPs to be released periodically didn’t get off to the brightest of starts with 'Pt 1', but this 'Pt 2' is a totally different species of weed so to speak. Vocalist Phil Anselmo is fighting fit and back on form – as witnessed by last year’s terrific album with his Illegals – and guitarist Pepper Keenan has taken a tighter reign on songwriting duties. The result is a terrific EP of six tunes that reference Down’s past ('Hogshead/Dogshead') and influences (the Black Sabbath sound of 'Conjure') and yet have new things to say ('Sufferer’s Years'). Anselmo has rarely sounded as good for a decade as he does on 'We Knew Him Well' and this record is a most welcome return to form for leaders of a genre. Read previous Simon Says columns here.